What’s good everyone? 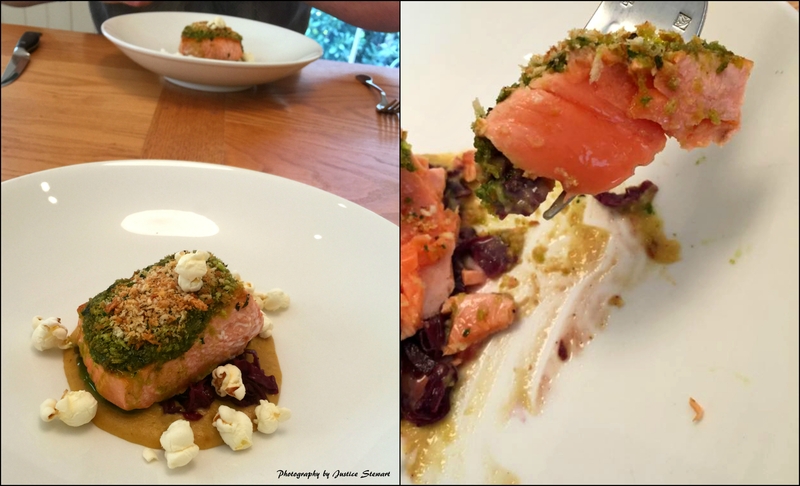 I recently traveled back California to enjoy more of its beautiful scenery, the wine, and most of all, the FOOD! Plus I wanted to be able to brag that I drove the entire length of the State and visited every county, lol. My last visit here we covered 1230 miles from San Francisco to San Diego visiting different cities over a 2 week period (read about it HERE). This time we are heading to see what Northern California has to offer. We will drive from SF to Crescent City, which is the northernmost city in the state. We only have 8 days this time, so our plan was to drive north first and then work our way down to wine country and celebrate my birthday weekend in the Napa/Sonoma area. We were lucky enough to have escaped a NYC heat wave that began the day of our flight (awesomeness). The one unfortunate thing is that California is currently experiencing a bad drought and there are many wildfires raging all over the state. During our entire drive we could smell the smoke, and at first we thought there were campfires burning, but what we actually smelled were forest fires, and we also encountered quite a few river beds drying out (Sorry Cali, I’m sure you will bounce back). 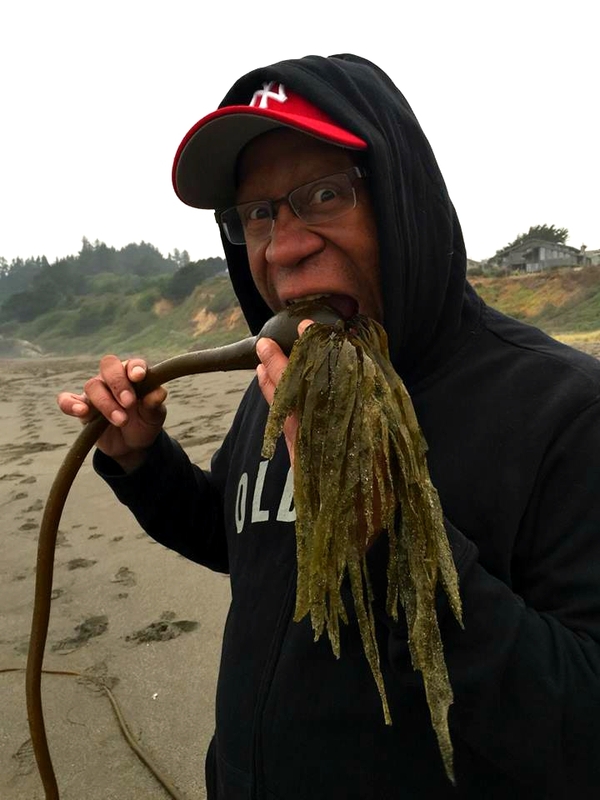 This visit to California had a different vibe, it was more relaxed and outdoorsy, but as always I craved another great culinary experience. We arrived in San Francisco around noon and decided to start the trip with good lunch after the long flight. The last time I traveled to SF I did not have the opportunity to actually walk around and explore the entire Chinatown district and since we were only to spend one night in this area, we are off to find Chinese food! I was tired of eating Chinese fast food and wanted some authentic tasting food. After wandering around we came across a long line of folks waiting in front of this small restaurant and we decided to investigate. 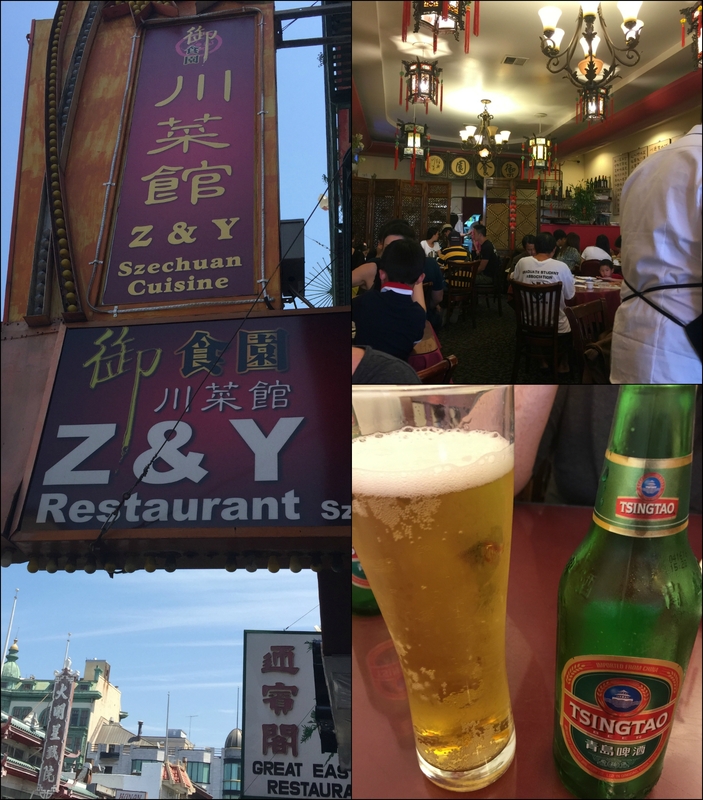 The name of the place was Z & Y restaurant at 655 Jackson St, and after a quick Google search I learned that it was rated one of the best Szechuan eateries in the city. After about a half an hour wait we were seated in this small and very busy restaurant. Most of the dishes on the menu are spicy, so if you hate this type of food steer clear of this place; but if you can tolerate a decent amount of spice, this place is for you. The menu had some other interesting things on it such as: “Numbing” beef tenders, spicy intestines (type of animal not described) and fresh frog dishes. We decided to order a few things: spicy fried prawns with jalapeno, dumplings in spicy chili sauce, house cold noodles (also spicy), and since I was feeling a bit adventurous (not unknown intestine adventurous) I ordered the frog in flaming chili oil. The food was amazing! 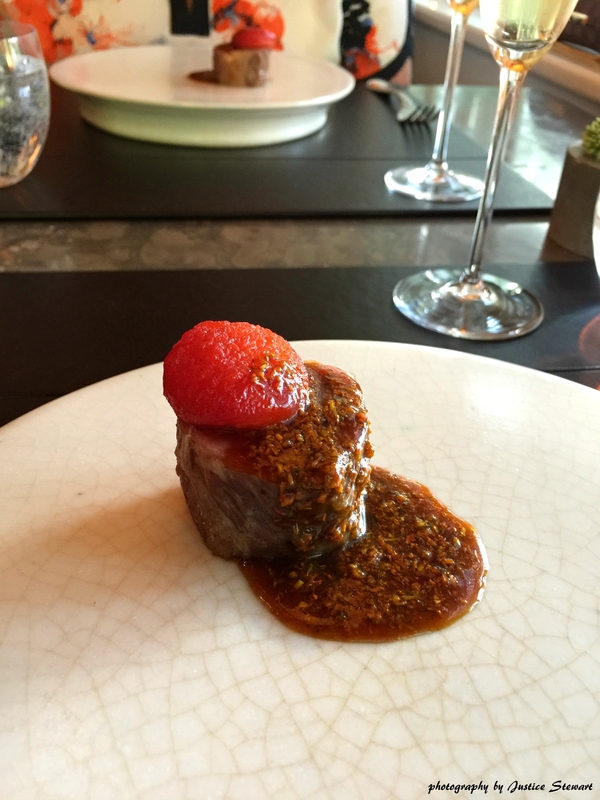 The use of the different types of peppers was well executed, and the food was not overly spicy like one would think. I was actually able to enjoy the food without screaming for water all night and each plate had a different type of spicy flavor and all of it was very delicious. I have cooked and eaten frog legs many times in the past, though only fried. I could tell from the first spoonful that this frog was freshly harvested and it was obvious that more than just the frog legs were used in this bowl, it seemed most of frog was used…. (yikes) hey waiter, I think I’ll have another beer now! We drove about 30 minutes north of SF to stay in San Rafael for the evening in a motel right off highway 101, so we could have a little bit of a head start on the long drive the next day. The hotel clerk recommended we walk down to San Rafael harbor to Pier 15 restaurant for dinner. We did not have high expectations of this place but the drinks were good, bartender was cool, the food decent, except the “prawn quesadilla” that seemed to have been prepared with the tiniest shrimp I have ever seen. The next morning we began our drive toward Trinity CA, which was about 6 hours north of our location and along the way we planned on driving through the “Avenue Of The Giants” which would set us back another hour, but who cares? 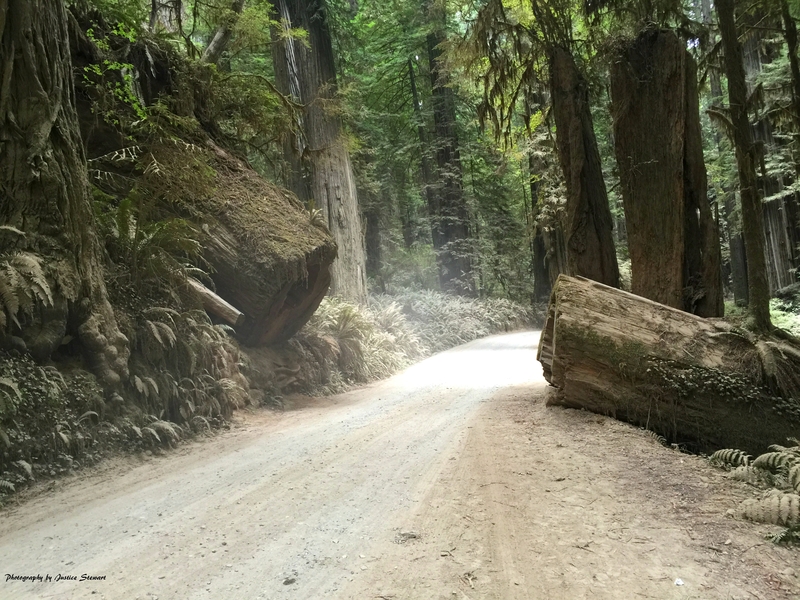 This road is a 31 mile stretch that used to be the old highway 101 and takes you through Humbolt Redwoods State Park with its winding roads and huge old-growth redwood trees. Upon entering the park we stopped at a small tourist spot for lunch called the Chimney Tree Grill that is situated beside a unique 1,500-year old hollow, living redwood tree. We had a couple of grass-fed beef burgers, and got attacked by a swarm of bees (they didn’t like us city folk I guess) so we moved on. We arrived in Trinidad late afternoon, and immediately got excited when we arrived at the beach home that we booked through the budget-friendly website AirBNB. We had a fishing trip planned 6:15 the next morning so I threw some coffee-crusted beef rib-eyes on the grill for dinner and we hit the sack early. The next morning at 5:30am the dock was deserted and the eerie combination of forest fire smoke and fog settled over the bay giving it an almost creepy horror movie-like feel (not that I was scared ). Our boat from Patrick point Charters arrived at 6 am and we were off to fish for salmon and rockfish in the rough Pacific Ocean waters. This trip was among one of the best fishing trips I have ever been on! Although it was cold, rainy, and the boat felt like it would flip over on the rough waters, the fishing was great. Emily was miserable with the weather and conditions, but also sort of happy with the fish jumping on the boat left and right like a cartoon. No one bagged any king salmon but we all hit the limit for blue & black rock fish (10 each=20 for us, woohoo!) and one sea trout within 90 minutes of a 5 hour fishing trip; and we continued to fish for another hour, perhaps throwing another-35-40 fish back in the water. 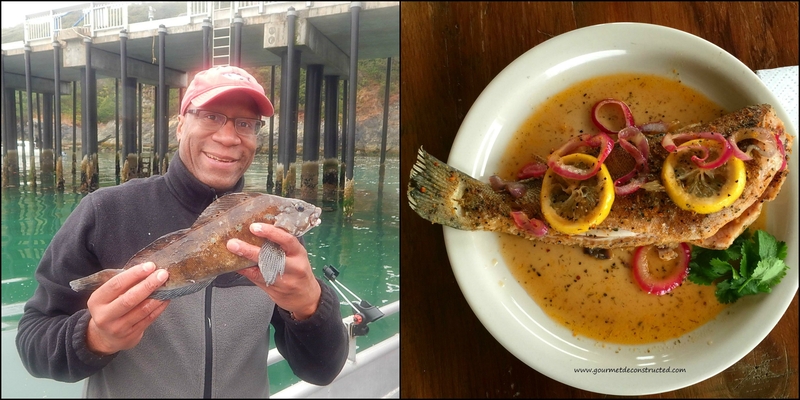 Ocean to table in one hour, Pan-Roasted Sea Trout w/Red Onion, Lemon, and Herb Sauce! 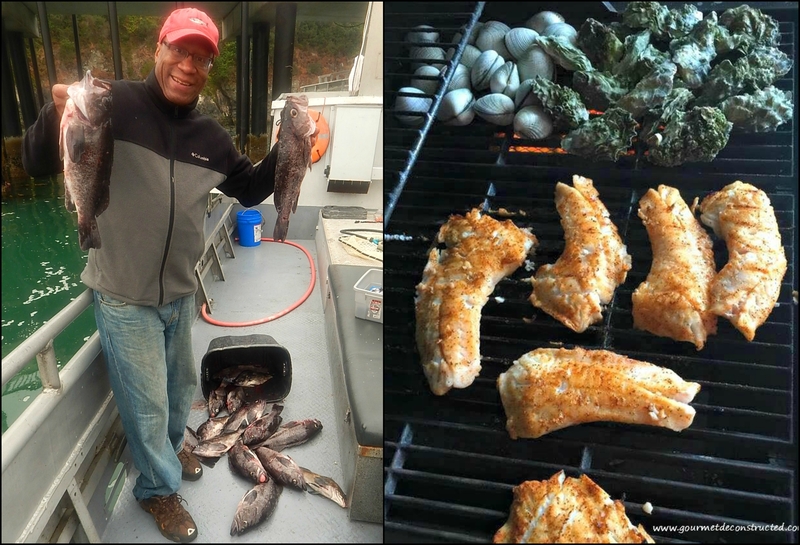 It was a good thing that we had a full kitchen and a grill where we were staying, because I was excited about cooking our fish. We spent the rest of the afternoon hanging out on the beach, hiking the Trinidad Head trail, cooking and eating fresh fish, then exploring this small fishing village. The next morning we continued our trek to the top of the state stopping in the Redwoods National Forest for a national park passport stamp and some photos, then driving another 90 minutes to Crescent City and the Jedediah State Park which is the home to the most beautiful of the old growth redwoods parks.The plan was to hike the Boy Scout Trail and the most popular trail, Stout Grove. 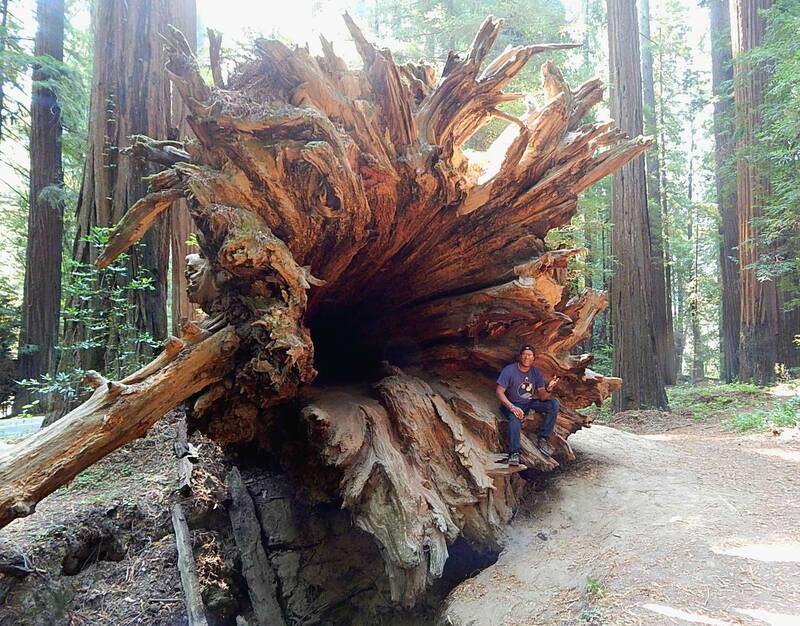 But a local hiker gave us some secret directions to what is known as “Grove Of Titans” which is a less traveled grove in the park that is home to ten of the world’s largest trees. 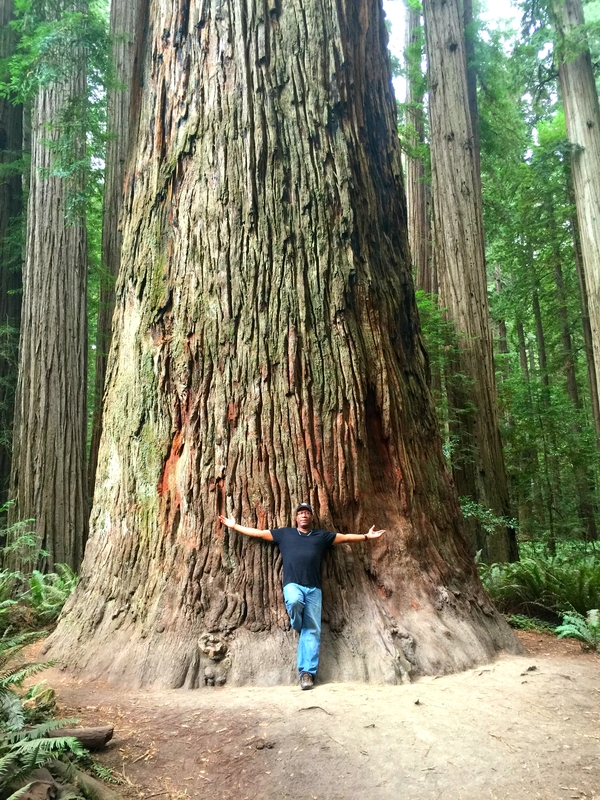 I could not believe the size of these trees, it made me feel small as an ant and it was so quiet and peaceful. We hiked most of the day, drank wine, and ate sandwiches in the middle of the forest then headed to Crescent City which is only 20 miles from the Oregon border for some sightseeing, before heading back to Trinidad for the evening. The next morning we purchase some smoked white sturgeon, albacore, local king salmon, and halibut from a cool place in Trinidad called Katy’s Smokehouse. We wanted a breakfast sandwich for the ride and stopped at the Beachcomber Cafe, where we ordered our food and drink to take along with us, only to find out after the food arrived that they don’t have plastic cups or plates because they are “Green”. So after getting some bad attitude from the heavily tattooed gal at the register (like we, as tourist should have known they did not have cups) we skipped the coffee, drank our apple juice on site, and were given our sandwiches on egg cartons as to-go plates (nice touch). It was time to embark on the next leg of this trip which is the 5 hour journey down south to wine country. California is a really beautiful state with so many different types of environments, from the awesome sunny beaches in the south, to the dramatic coastal rocky cliffs and cooler weather in the north. I mean, in Trinidad we had to wear jackets in the morning mid-August because of the 45-50 degree temperatures, with daytime highs of only 70 degrees. But as we drove more inland and further south the temps began to warm up enough to shed our sweaters. We passed through the “small” town of Legget, and by small, I mean The town has a single gas station, K-12 school, a small grocery store, restaurant, full service mechanic, fire station and the famous Drive-Thru Tree (which we opted not to do for a $6 fee). For lunch we came across this great roadside outdoor restaurant called “The Peg House” that featured an amazing blackberry sundae and some huge and delicious BBQ oysters. Our hosts Lori & Avram were awesome! We arrived in the Sonoma area early afternoon and boy was it hot here (90 degrees), so we headed towards another place I booked through AirBNB. This was listed as a poolside cabana located on a private vineyard and owned by married couple Lori & Avram; She is an artist and teacher, he is into real estate and is a local winemaker. These were two of the best host we have ever met and their property was amazing! They have a nice sized vineyard on the property along with two private poolside cabanas, picnic tables under a walnut tree and a magnolia tree, a hammock among the growing grapes, different types fruit trees all over, and the heated pool… my goodness, that pool. We were greeted by Lori with a bottle of their wine “Tres Hijas”, and since I still had tons of fish packed on ice, I gave her some because she told me she loved cooking and was also a foodie; she was also nice enough to refrigerate the rest for me. 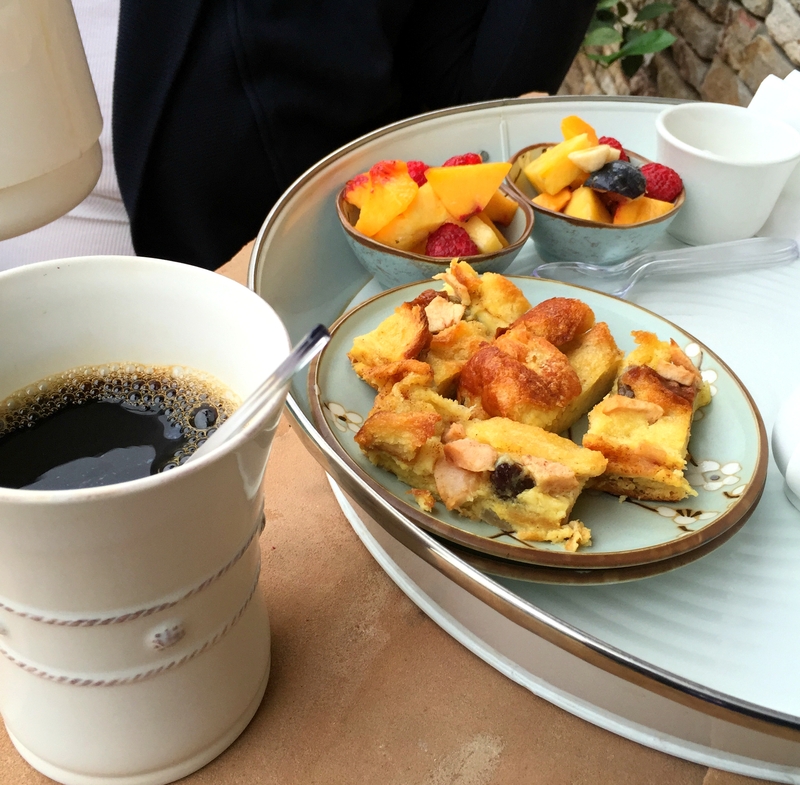 She surprised us each morning with homemade pastries, coffee, and fresh fruit picked from the property each day, great people! After a busy day of eating and driving we got some well needed rest and I woke up on my birthday feeling refreshed, so I took a couple of laps in the pool and we decided to head to breakfast at the Black Bear Diner. They served up some decent food in large portions, which was fine with me since we had no problem with skipping lunch because we had big dinner plans that evening and I wanted to be very hungry for it. 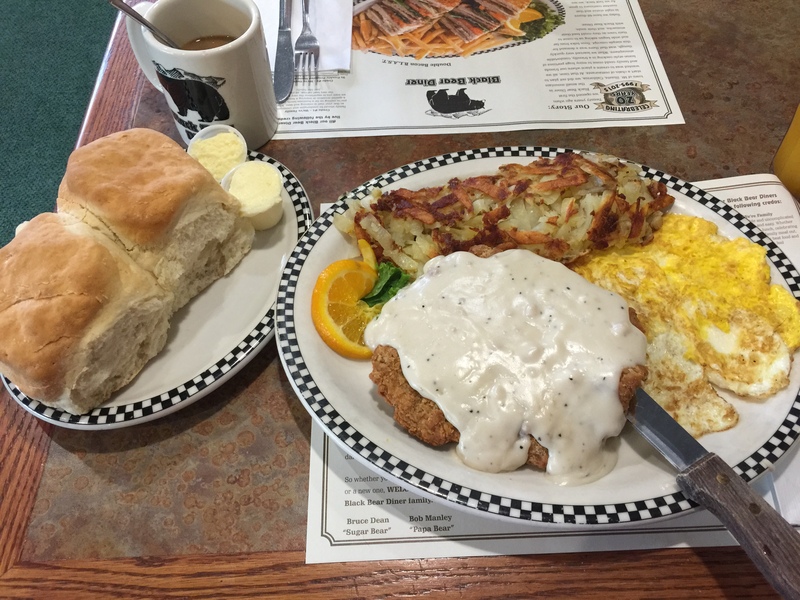 I had the chicken fried steak, egg, hash browns, and two of the biggest biscuits I’ve ever eaten! Since we are on vacation, and we have a full bellies, plus it’s my birthday it gave us an excuse to drink alcohol at 10 in the morning, so off to the wineries we go! Our plans for my birthday was to do two winery tours, and have dinner at the 3 Michelin star Restaurant at Meadowood. 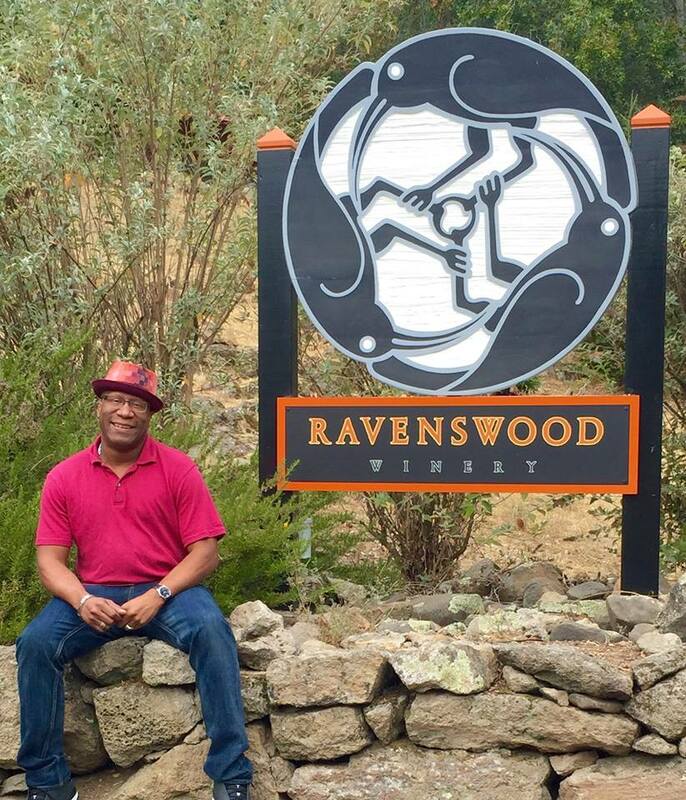 We visited Ravenswood winery first, since I come from a neighborhood that shares the same name (not the winery part though lol). 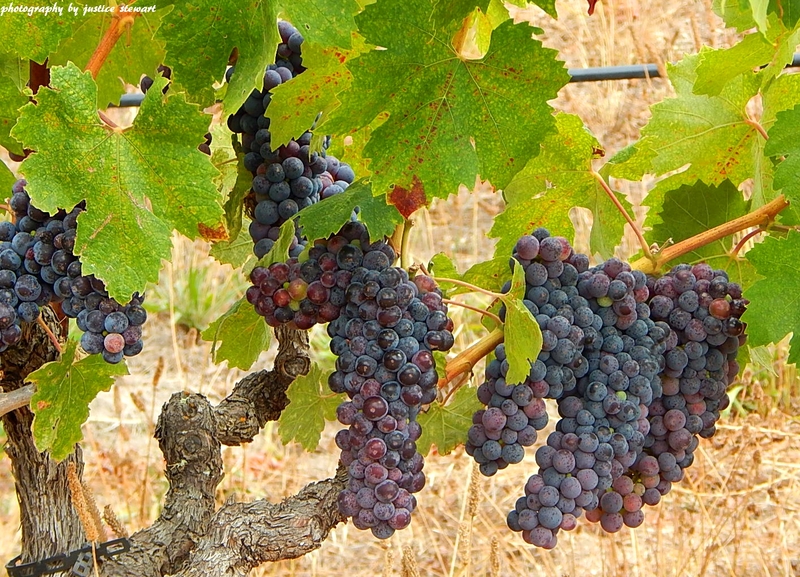 We then wandered around downtown Sonoma sightseeing, toured Beringer’s cool wine caves, and then prepared for dinner. I received many birthday wishes from the Meadowood staff. Now this was the dinner we were excited about! 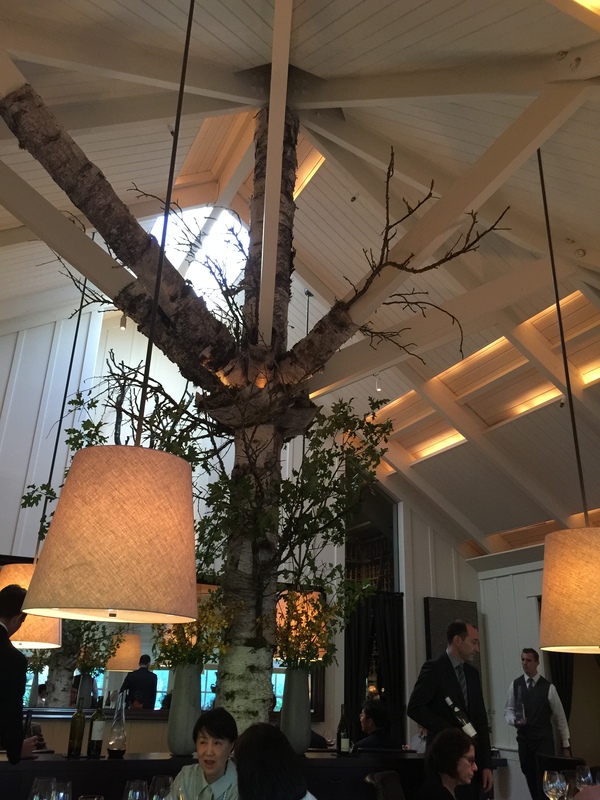 We tried to book reservations for Chef Thomas Keller’s “French Laundry” 2 months in advance and were unable to, and a friend of mine recommended The Restaurant At Meadowood in the heart of wine country. We arrived to a very large full parking lot and parked quite distance from the restaurant, so when the valet asked me for the key and I refused, telling him we are deep in the lot and we will get it ourselves, but he insisted without even seeing where we parked (ok, that was a little weird). 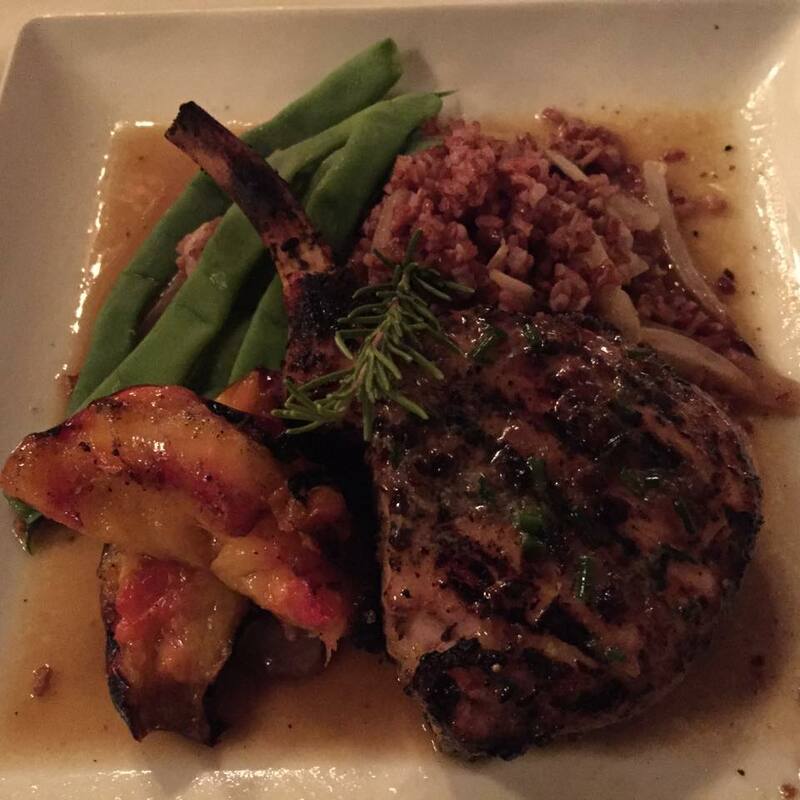 The decor of this place gave you a fresh outdoor dining feel and it had a really friendly and accommodating staff. The next day which was our last full day in California, so we slept late kicked back at the pool the rest of the morning. we had lunch plans with some friends. We met our pals Sal and Delores via Facebook years ago and finally got to meet them in person. We met for lunch in Napa at a Italian restaurant very popular with the locals, Bistro Don Giovanni. Sal is is originally from my area in Queens NY and moved to the west coast in 1981 and he loves good food and wine just like me, so I trusted his judgement and expertise.The restaurant was bustling with people and it had a nice modern decor with an open kitchen, and the food was great. 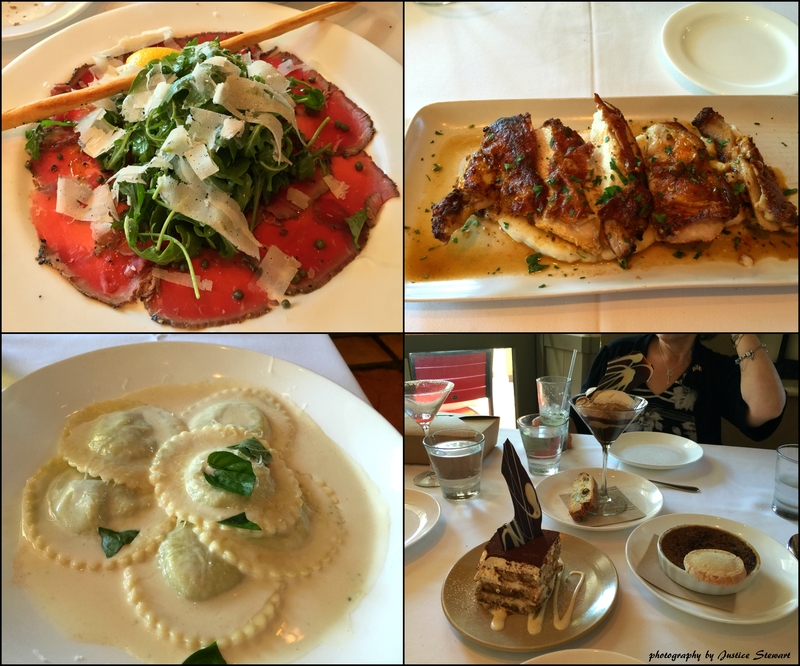 The brand new friendships and great conversation, in addition to the great food created nothing short of an awesome experience.The tasty chicken fra diavolo, fresh ravioli, steak frites, and the expresso crème brûlée were the highlights of the afternoon, and we all left happy. 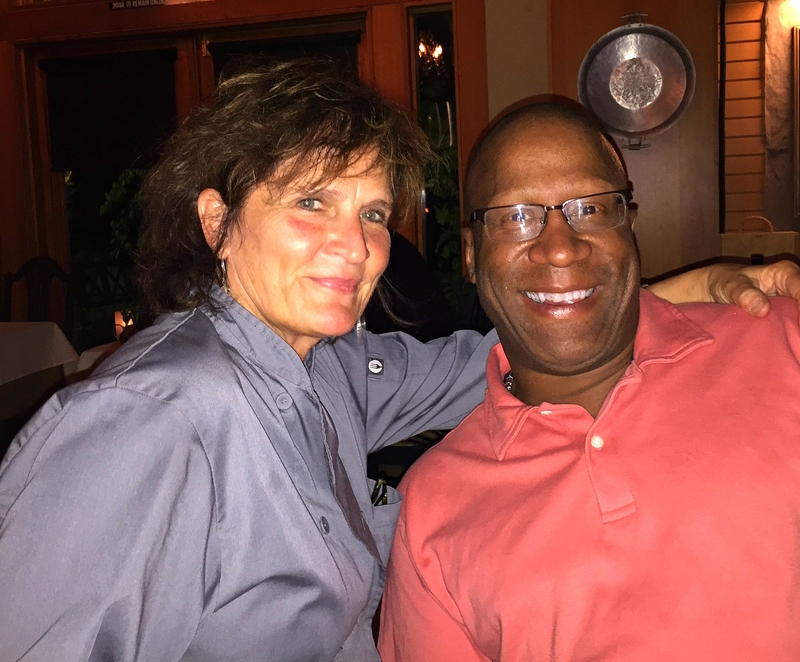 Later that night we had dinner at a wonderful restaurant that Lori our host recommended called Olive & Vine. 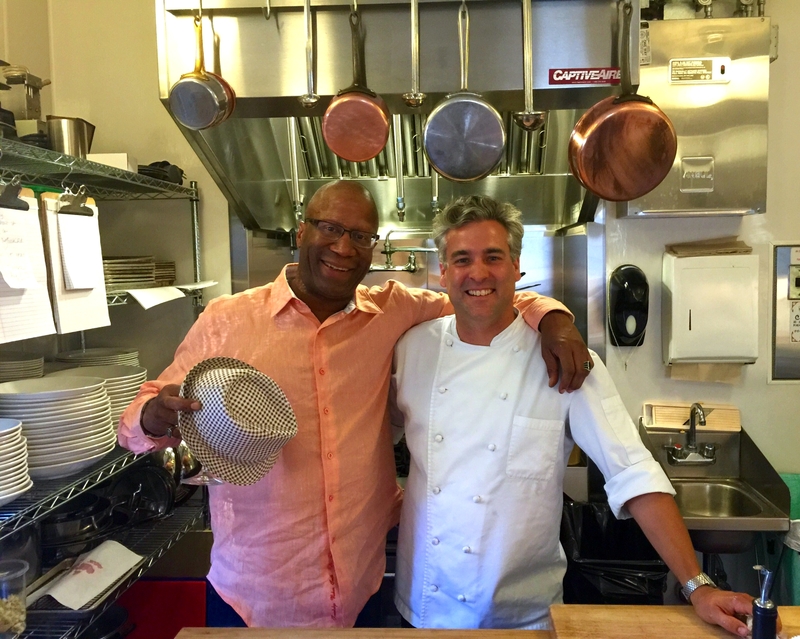 The Olive & Vine restaurant in Glen Ellen CA is co-owned by Chef Catherine Venturini and Sommelier John Burdick. It is a very busy place and lucky for us Lori was friends with the owner, and she called and got us a short notice reservation. We were not disappointed at all, the food was wonderful and John recommended some very good wine for our meal and Chef Catherine came to the table to wish me a happy birthday, and she also frequently made her way around the restaurant to check on the guest, and then jumping back on the line to help get food out, an amazing woman. 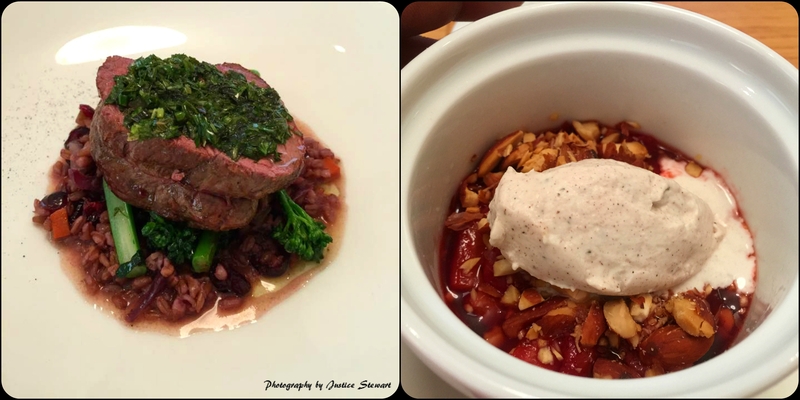 The highlights of this meal were the black cod & bok choy dumplings in lemongrass, kaffir lime broth w/ chili infused oils & sweet pea shoots, also Emily really praised the mustard grilled Niman Ranch pork chop. 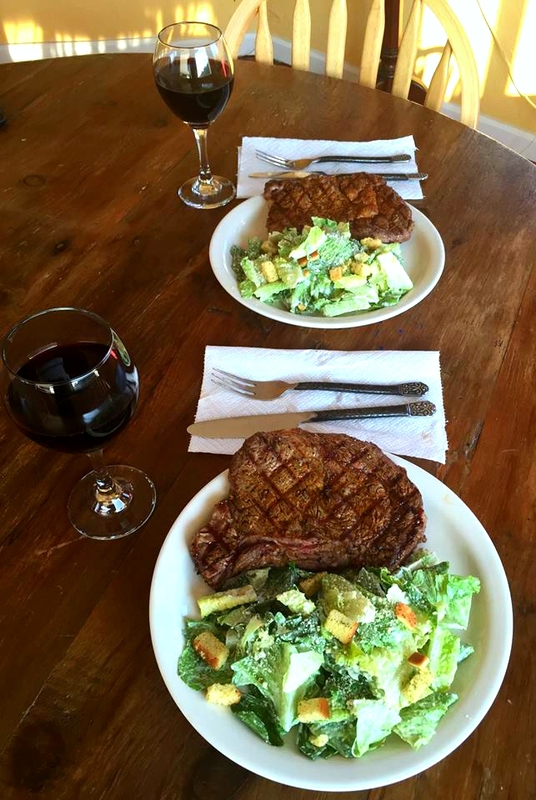 Our last dinner in California turned out to be one of the best! We spent our last evening by the pool watching Netflix on my laptop and drinking wine made by our hosts. Our flight the next day was in the late afternoon and we were in no rush to take the 1 hour 15 minute drive to the San Francisco airport. One of our friends from back east suggested we visit the Fremont Diner for brunch. The place was old school and very country-like in decor, and we chose to be seated outside with some great mimosas served in mason jars. I went with the classic spicy chicken and waffles and emily decided to have something called the “Hangtown Fry” which was scrambled eggs, fried oysters, arugula, & potatoes w/remoulade & bacon (sounds horrible lol). While I loved my perfectly cooked food, Emily was quite disappointed with her breakfast. It looked great and I told her the reason may be that she is not an “oysters in the morning” type of person, In my opinion having oysters with eggs really made it a weird breakfast. 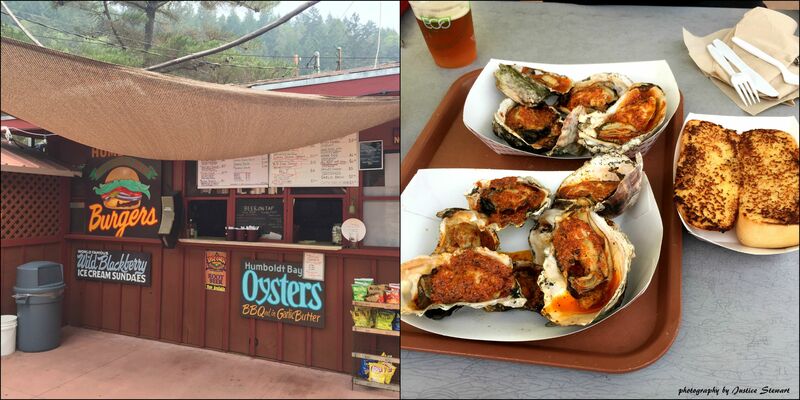 Posted on August 19, 2015, in Foodie Road Trips & Other Fun Things and tagged airbnb, avenue of giants, Avenue Of The Giants, beringer, bistro don giovanni, boat, california, Chinese food, crescent city, farmstead at long meadow ranch, fine dining, fishing, foodie, Fremont diner, hiking, katy's smokehouse, napavalley, Northern California, olive & Vine restaurant, patrick point charters, ravenswood winery, Redwood forest, restaurant at meadowood, roadtrip, sonoma, State Park, the peg house, trinidad, unforgettable experience, vineyards, winery, z&y restaurant. Bookmark the permalink. 10 Comments. Great read, feel like i took a quick trip Cali!!! Thanks Justice for sharing your road trip with us. It amaze me how you make all your food adventures sounds so delicious and you have no problem trying new foods. I enjoyed the trip through your eyes. Very wonderful food, wine, and scenic road trip! I was with you guys every step of the way, with my minds eye putting me there in each description of your journey. While I did have a very nice glass of Pinot Grigio on hand as I read, I am feeling a bit famished lol. The photos of the cuisine was awesome. I guess I need to get into the kitchen now (thanks) and rattle a few pots and pans. I didn’t realize we did so much until I read your account! Clearly you guys had quite some journey filled with the best of everything! 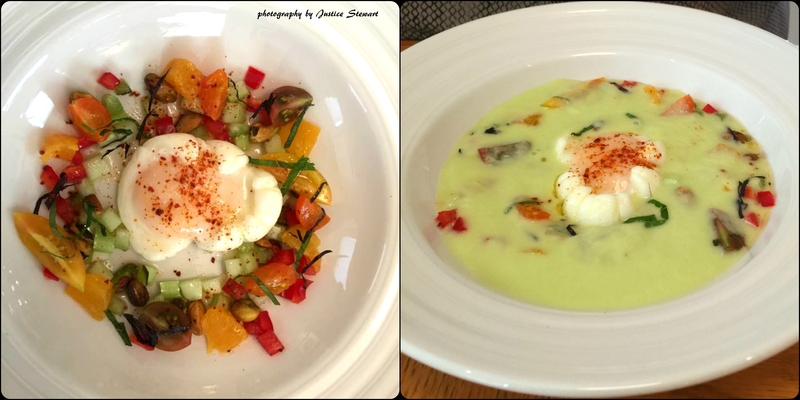 Love the photos Chef and the read was descriptive and finely done. You have done a a great job of making me homesick, lol no but more than that; what a pleasure seeing you enjoying your trip to the max and making lasting memories for years to come. 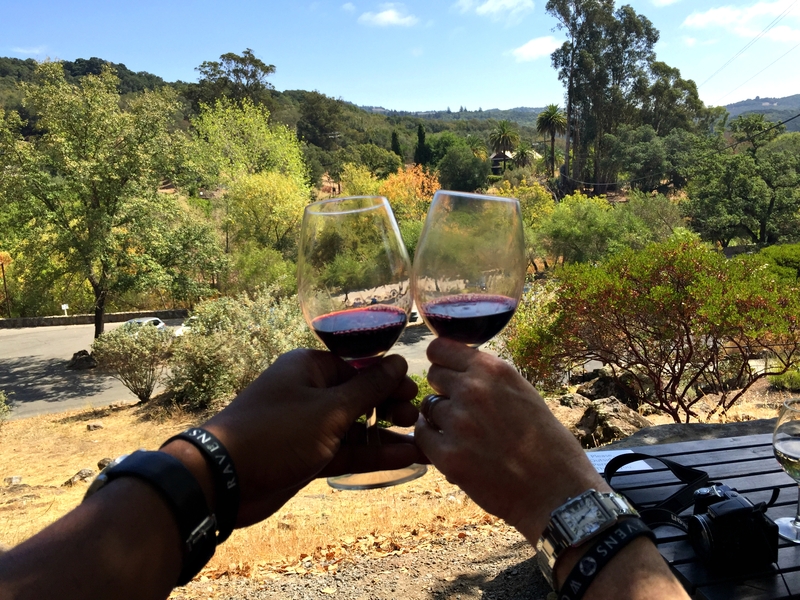 Thank you so much for sharing friend, until the next adventure… cheers!